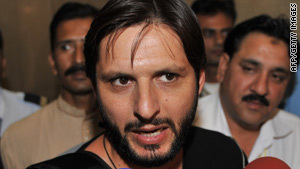 Top Pakistani cricket players such as Shahid Afridi were ignored in this week's IPL auction in India. New Delhi, India (CNN) -- A fresh row has erupted between India and Pakistan -- this time over cricket. The latest dispute stemmed from franchises of the Indian Premier League (IPL) shunning all 11 Pakistani players from the auction list of what is billed as the world's richest cricket tournament. India's government rejected news reports that fears it would not grant visas to Pakistani cricketers for the event to be hosted in the country kept the club owners from buying them at Tuesday's auction in Mumbai. "Such apprehension is completely misplaced," India's External Affairs Ministry said in a statement. It insisted that 17 Pakistani cricketers had already been issued Indian visas in more than a month for the IPL's 2010 season. In a terse response to Pakistan's protests over the IPL snub to its players, India called upon its South Asian neighbor to "introspect'' on why their ties were strained. In its statement, the ministry explained the government had no links with a commercial venture like the IPL. "The participation or absence of Pakistani cricketers in a commercial event of the nature of IPL is, thus, a matter not within the purview of the government." Yet, it described as unfortunate Pakistan's furious reaction. "Pakistan should introspect on the reasons which have put a strain on relations between India and Pakistan, and have adversely impacted on peace, stability and prosperity in the region," the ministry said. Last week, the two countries pledged what they called cooperation on humanitarian issues, more than a year after the deadly 2008 terror strikes in Mumbai froze their peace dialogue.